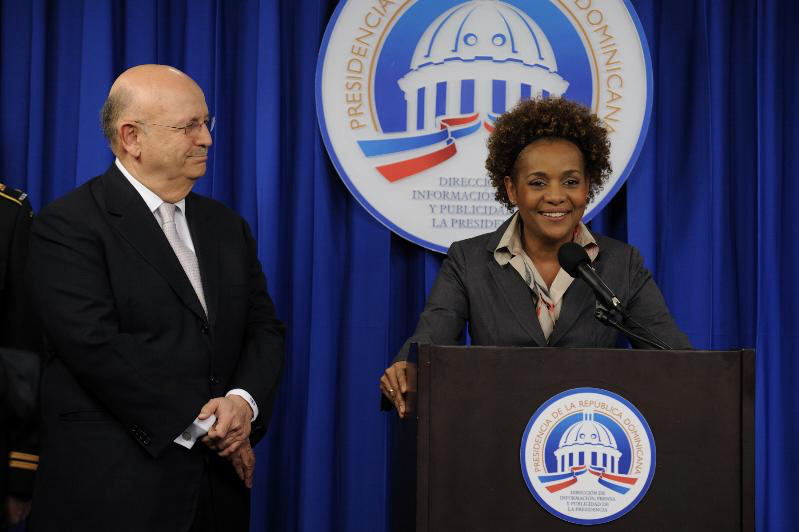 March 9 and 10, 2010, Her Excellency Michaëlle Jean, Governor General of Canada, accompanied by her husband, His Excellency Jean-Daniel Lafond, visited the Dominican Republic to strengthen the relations between the Republic and Canada and to recognize the Dominicans’ exemplary leadership in reacting to the Haitian crisis. Their Excellencies met with the president, Leonel Fernandez, and members of the civil society. 〝Canada is delighted to see how eagerly the government and people of the Dominican Republic have shown their support to their neighbour Haiti, the poorest country in the Americas. We would also like to thank the Dominican Republic for all the support and assistance provided to the Canadian relief effort. This close collaboration is proof of the solid ties that exist between our two countries〞. — Michaëlle Jean, March 10, 2010. The Governor General seized the opportunity of her visit to the Dominican Republic to thank Dominicans for helping their neighbour Haiti after the earthquake that killed thousands of Haitians. Her Excellency met with the President of the Dominican Republic Mr. Leonel Fernandez to discuss the two countries’ relationship, as well as the efforts made by Dominicans to help Haiti following the earthquake. The meeting took place at the Presidential Palace.